In this Dec. 15, 2014, file photo, Saudi journalist Jamal Khashoggi speaks during a press conference in Manama, Bahrain. WASHINGTON — The Trump administration declined Friday to submit a report to Congress determining whether Saudi Arabia’s crown prince is personally responsible for the killing of journalist Jamal Khashoggi. 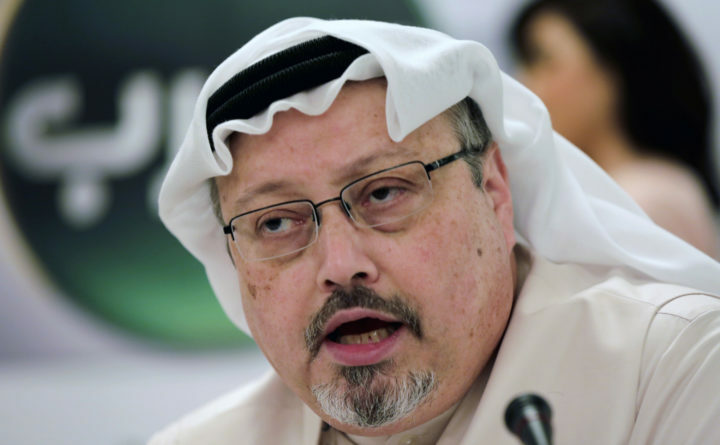 Senators had asked for the finding by Friday, with an eye to imposing new human rights sanctions on Saudi Arabia over the journalist’s Oct. 2 killing inside the Saudi Consulate in Istanbul. Under the Magnitsky Act, the president has 120 days to respond to a direct request from Congress about possible violations. The request, made Oct. 10 in a letter signed by 11 Democratic and 11 Republican senators, required the administration to make a determination of responsibility for the killing, particularly including involvement by the Saudi royal family, and to act on it by imposing sanctions on responsible individuals. The Trump administration cited the constitutional separation of powers and the precedent of the Obama administration in declining to meet what the lawmakers had called a deadline. The decision was expected, and a bipartisan Senate bill introduced Thursday would supersede the request and direct the president to impose sanctions on anyone — including Saudi officials and the royal family — he determines was “responsible, or complicit in, ordering, controlling, or otherwise directing” acts that caused or contributed to Khashoggi’s death. The new legislation relies on the authority of the Global Magnitsky Human Rights Accountability Act, and imposes a 30-day deadline from the date of passage for presidential findings and sanctions imposition. The act is named after a Russian whistleblower, Sergei Magnitsky, who died while in detention in Russia after being beaten and denied medical care. U.S. intelligence agencies have concluded that Khashoggi’s killing was premeditated and almost certainly carried out on orders from Crown Prince Mohammed bin Salman. The Saudi government claims that the prince, who is the kingdom’s de facto ruler, was not involved. Trump announced in November that he would not downgrade the U.S. relationship with Saudi Arabia, regardless of whether Saudi rulers were culpable. Discounting his administration’s intelligence findings, Trump has repeatedly pointed to the lack of a single piece of evidence, or a “smoking gun,” that would irrefutably pin blame on the prince. The administration has said it continues to investigate the killing. “Seeing as the Trump administration has no intention of insisting on full accountability for Mr. Khashoggi’s murderers, it is time for Congress to step in and impose real consequences to fundamentally reexamine our relationship with the Kingdom of Saudi Arabia and with the Saudi-led coalition in Yemen,” Sen. Robert Menendez of New Jersey, the ranking Democrat on the Senate Foreign Relations Committee, said in a statement Thursday. Menendez and Sen. Bob Corker, R-Tenn., had requested the report in October, shortly after Khashoggi, a Washington Post contributing columnist and U.S. resident, disappeared. Late Friday, Menendez said he had received what he called a letter from Pompeo. “The Administration failed to meet its legal requirement to make a determination of responsibility for this heinous murder and report to Congress. I am very disappointed that the response from Secretary Pompeo doesn’t come close to fulfilling the statutory mandate and demonstrates what the administration has wanted all along — the Khashoggi murder to be forgotten,” Menendez wrote in a statement. The new legislation, sponsored by Republican Sens. Lindsey Graham of South Carolina, Susan Collins of Maine and Todd Young of Indiana, as well as Democrats Menendez, Jack Reed of Rhode Island, Jeanne Shaheen of New Hampshire and Chris Murphy of Connecticut, would also prohibit certain arms sales to Saudi Arabia and in-flight refueling of Saudi coalition aircraft in Yemen. Young and Shaheen released a separate letter to Pompeo on Thursday, in advance of a Saturday deadline for the administration to certify that Saudi Arabia is taking “demonstrable actions” to minimize the danger to civilians from its war effort in Yemen. “We know that this was a rogue operation,” Jubeir told reporters gathered at Saudi Arabia’s Embassy. “We came out and we acknowledged it, that it was committed by officials of the Saudi government, acting outside their authority and outside their responsibilities. And that’s why they’re charged,” he said of the 11 unnamed Saudis on trial in Riyadh. Accusing the crown prince, he said, “is like saying, when Oliver North was engaged in Iran-contra, did Ronald Reagan know? Two hearings are known to have been held so far in the case, in which prosecutors have asked for the death penalty for five of the 11 charged. Jubeir said that representatives of the permanent five members of the U.N. Security Council, and of Turkey, have been invited to attend, “and I believe they have.” He said that the allegations and continued controversy has not affected Saudi Arabia’s relationships with other countries. Asked about the bill introduced this week, Jubeir said that “there’s no need to be taking steps like this, because we are doing what we need to do. … I think logic would say, wait until the process plays out, and then judge it. Here, I think people are putting the cart before the horse, and I believe that’s driven in part by politics, in part by the atmosphere in Washington. It’s a horrific crime. We understand that. But I think wisdom has to prevail, and people have to let the legal process play out,” he said. Suggesting that Congress was holding Saudi Arabia to a higher standard than other countries, Jubeir said, “You’ve had so many journalists murdered in the last year, are they going to legislate sanctions against all countries in which journalists have been killed? I think the view is, they wait until the results come out, and where there is guilt, you can take action. “I wish the Congress would take a step back, look at the overall relationship, look at the steps that Saudi Arabia has taken, and let the process play out,” he added.